Today is a day that we all remember where we were, how we felt – anger, confusion, and sadness. We wanted someone to blame, and I am not going to get political on this but we did! Why would someone whoever it was, do something like this? I remember that day so well – I left for school and turned on the radio, all I heard was news! A plane crashed. All I could think though was, just another plane crash. Sadly enough. Then when I got to school no one said anything about it till I was walking down the halls my senior year of high school. Collecting attendance slips for that period, and I got to a class room and was wondering why everyone was staring at the TV. No one was talking, they were just staring. I then got to the library, and asked the first teacher I saw – and they told me that a plane hit one of the towers in New York City. I was shocked, sad, angry – and clearly just wanted the answer WHY answered. For the next few hours, we watched the TV, talked to each other and comforted each other. One of my teachers whose wife was a flight attendant was flying out east at the time, and her flight was grounded – but he had no clue of one of the planes was hers or not for HOURS! Scary right? There were times during the passing weeks my family turned off the TV, and wouldn’t turn it back on unless we were to watch a movie. We just couldn’t watch the sadness anymore. They were playing over and over the heartbreaking videos of the crash, people jumping, and ash covered people. I remember having nightmares that we were going to be going to war. I didn’t know what to do or think. It was supposed to be the happiest year of my High School years. I was a senior and months were filled with anger, war, and sadness – due to a group of peoples hate. As the years passed, and we are still at war – I relive that day year after year on this date. We remember the loved ones that are missed and lost their lives WAY too soon. You hear the stories of the people who called in sick that day, that went on an errand, that was late for work, that decided to sleep in, and so on. The people that were lucky enough to not be at work that day in the Towers and the Pentagon. The stories of the people on the ground, who saw the planes fly by, ash falling, fire burning, people jumping, running and screaming. The countless Firemen, Policemen, and Emergency workers risking their lives to save those they could get to, those rescue workers that lost their lives to save a few. My heart sinks every time I think of them, that day. 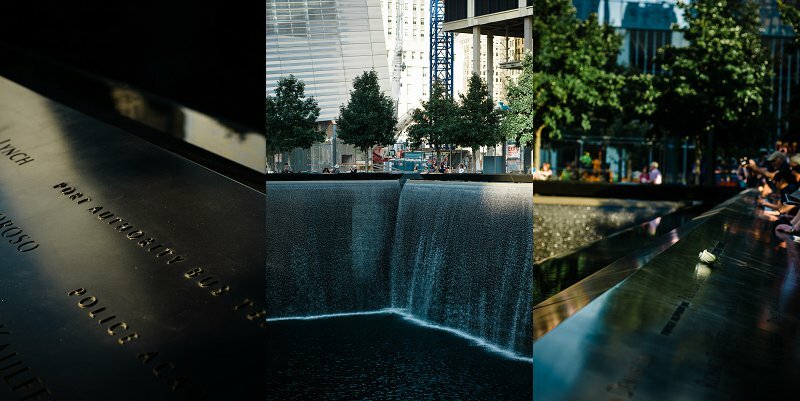 Today I remember that day, those people and the towers – a day when the world changed. The country changed, a city changed. I changed. A day that we will never know the truth behind it all. A day where we think twice about our country, family, friends, and self. Today my heart goes out to those that lost someone, I wish there was more I could do. Today I remember those who are fighting the war that day started – I am wishing you a safe return to your loved ones. To this day – every plane crash, movie about 9/11, talk of war, I get scared, I cry, I worry. My boyfriend is a Marine – out of good, cannot get called back – but I still worry with talk of Iran, Syria that he will volunteer to fight. I do not understand war, never will – I blindly wish for a kinder, calmer world that will never come. But I every day give smiles, bad jokes, and kindness to those around me. The smallest stone still makes a ripple….